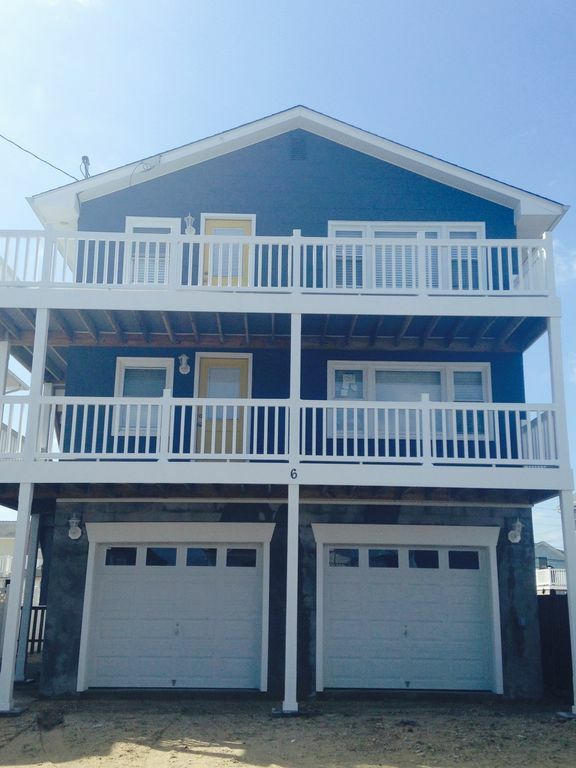 2nd Floor - Upper unit of oceanside duplex with open floor plan is located in Beach Haven Gardens, Long Beach Island. Unit contains 3 Bedrooms, 1 Bathroom, washer & dryer, outdoor grill, and outdoor shower. Nice views from unit. Great location. Take a short leisurely walk to the beach or to the scenic bay. About 1 mile to Bay Village. You can leave your car and walk to restaurants, shops, ice cream, wawa, donut shop. On Ocean SIde and walk to beach is great easy. Walk to everything - located on the beach side, a 24-hr. WAWA, restaurants, ice cream, donut/bagels, variety shops, liquor store, bank, gas station. Has own shower for unit. Very clean and great location. We stayed here for a wedding with 3 young kids. Yes a lot of stairs but everything is raised now in LBI so no biggie. Loved the views and easy walk to bay or ocean. Would stay here again. We had a great weekend staying at your home. It truly fit all our needs.The weather was perfect for the wedding ! The accommodations were right on the money. Beds were comfy which is always a plus... BUT the best was the OUTSIDE SHOWER !! Thanks again for opening your home ! Perfect rental for our beach vacation! We are a family of 5 and the space was great for what we needed. We will definitely be returning! Wonderful location. It was the perfect size for our family of four. Meltdown ice cream parlor, el swell tacos, yoga Bohemia, are all just steps away. Very clean and updated. We will definitely come again. We rented this place for our family reunion on the top floor. The property is neat and clean. The layout is just excellent with all the amenities one may expect in a rental property. It was very close to the gas station and the beach so we had a great time. Except for going up 30 steps for the second floor, which might me a good exercise for some but not for my old knees, was a bit hassle with suitcases and heavy stuff. The owner is very friendly and cooperative. The house is centrally located in Beach Haven Gardens. We are in walking distance to Wawa, California Grill, Woodies Burger Shack, Howard's Restaurant, Marvel's Bakery, Terrace Tavern, Swell Taco and the Meltdown Ice Cream. Bay Village is about a little over a 1 mile walk.